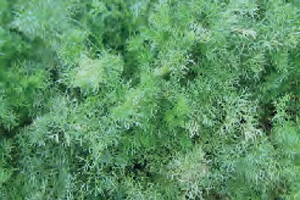 Site: This herb thrives in damp, cool springs and hot, dry summers. It requires mostly sunshine but can be grown in morning sun and shade in the hot afternoon. Choose a site where soil is well-drained and amended with plenty of compost. Growing: When plants emerge, thin them to 4 inches apart and mulch to conserve moisture and deter weeds. Keep a close eye on young plants to make sure they don't dry out. Once established, it needs just a little water. Like most herbs, cilantro performs well in containers, but choose pots that are at least 12 inches deep to accommodate the plant's taproot. Use potting soil enriched with compost and water regularly. Harvesting: You can grow this Mediterranean native for its leaves, which are known as cilantro, or for its dried seeds, called coriander. To harvest Cilantro, you can begin cutting as soon as the plant is about 6" tall by removing the outer leaves and leaving the growing point intact for the new leaves to grow from. Or you can harvest entire plants when they're about 6 inches high if you want only the leaves. If the target you want is the seeds; wait until the seeds start to ripen, in late summer or early autumn. Then cut the plants off at the base and hang them upside down in paper bags to finish drying. 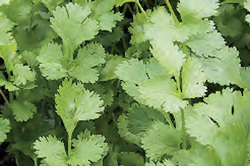 Culinary Uses: Cilantro, also known as Chinese parsley is a staple herb of both Asian and Mexican cuisine. Coriander seed has no similarity in taste to cilantro leaf. Ground coriander is used in desserts as well as in curries, meat, and seafood dishes. Add it to stews and marinades for a distinctive Mediterranean flavor.